Skin disorders affect children and adults. Atopic dermatitis is most prevalent in children with increasing frequency. (1) Other disabling skin disorders, such psoriasis, urticaria and acne are often present in adulthood. All skin diseases cited above implicate the immune system. It is assumed that type 1 allergy plays a major role, but recent studies show up to 20% of the cases are non-IgE mediated allergies (4). While IgE-mediated allergic skin disorders appear immediately after contact with the allergen, IgG mediated sensitivity is delayed from hours up to days, making it extremely difficult to identify the culprit. Because the symptoms lack specificity, patient self-diagnosis is difficult. Common to all these inflammatory diseases is the infiltration of circulating immune complexes in the tissue and attraction of phagocytic immune cells to destroy the complexes locally, resulting in an inflammatory skin manifestation. A study from 2010 (7) showed that all allergic patients, including those showing only IgG and IgA antibodies, significantly ameliorated their symptoms, and their levels of beef-specific antibodies were considerably reduced in response to a cow meat exclusion diet. 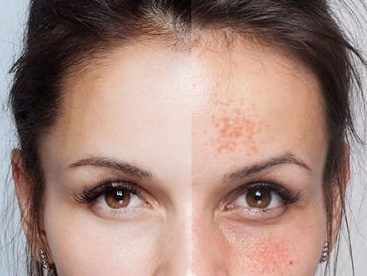 In observation trials performed with Imupro, 65% of cases of psoriasis, 73,9% itchy skin, 67,2% atopic eczema, and 67% of acne have significantly improved or disappeared completely. (10,11) The survey showed that those patients strictly following the diet recommendations had the highest improvement of symptoms. reactions prevail and generalized recommendations are not suitable. disorders in children? A comparison between 1987 and 2001. BMC Dermatol. 2006;6:4. 2. Millington GW. Epigenetics and dermatological disease. Pharmacogenomics. of food intolerance. Deutsches Ärzteblatt International 2009, 106 (21), 359–369. allergic patients: clinical association and modulation by exclusion diet. J Biol Regul Homeost Agents. 2010 Jul-Sep;24(3):261-71.
brewer‘s yeast-exclusion diet. Surgery. 2013 Nov;154(5):1126-30. 11. Lebensmittelunverträglichkeit, Allergie Typ 3 erkennen und richtig behandeln.